Dravida Munnetra Kazhagam (DMK) on 31 may jumped on the beef ban protest bandwagon in the state. 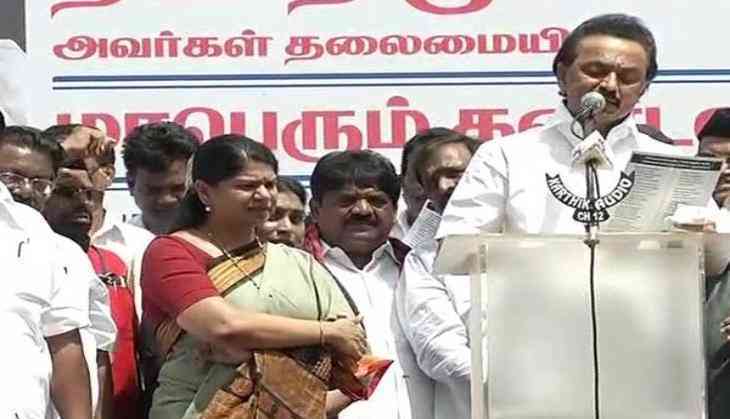 DMK working president M K Stalin and party leader Kanimozhi led a protest against the Centre on the cattle slaughter ban. Before courting arrest, Stalin slammed the Centre's move and said peoples' individual rights were being snatched away by the Narendra Modi government. "Our individual rights are being snatched away by central government. Our freedom is taken away by Modi government. How could Central government impose restrictions on our food habits? Do we have to eat only what Modi likes," questioned Stalin. The DMK also crticised the current Edappadi K. Palaniswami government in Tamil Nadu and asked why the government was tight-lipped on the issue. "We condemn state government and the Centre for their indifference on people's sentiment, said the DMK leader. At a time when the NDA government is organising M.O.D.I (Making of Developed India) fest to highlight its three-year rule's achievements, Stalin criticised Modi government's rule and said the government only caused misery to people. "We cannot pinpoint any achievement of BJP led Union Government in these three years. They have only caused misery to people. They promised to enact Lokpal and bring black money stashed abroad, but none of these promises were fulfilled," alleged Stalin. He also trained his guns at the All India Anna Dravida Munnetra Kazhagam ( AIADMK) led Tamil Nadu Government along with Prime Minister Modi. "The AIA DMK Government is in power for six years. We have seen three Chief Ministers in six years. All these CMs met Modi five times and presented a memorandum of issues concerning Tamil Nadu. But has Modi fulfilled any one of the issues?" said Stalin. There have been protests in Tamil Nadu and neighbouring states like Kerala and Karnataka against the Centre's order on the cattle sale in the county. According to the notification under the Prevention of Cruelty to Animals (PCA) Act of 1960 that gives the Centre powers over animal welfare, the committees overseeing animal markets will have to take an undertaking from traders that "animals are bought for agriculture purposes and not for slaughter".